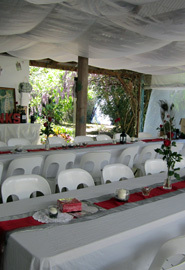 Eternity Springs Art Farm has all the infrastructure for groups (up to 24+) for activities in 3 different venues. 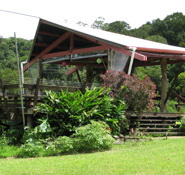 Includes kitchen, dinning and scullery facilities, use of 40 folding chairs, 4 trestle tables, outdoor heating, BBQ, gas stoves and oven, large pots, large rice cooker, garden herbs and spices, cob pizza oven, cool pool. 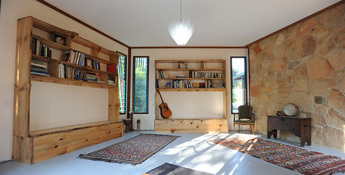 ‘Inner space’ is a 40 sq mt internal pentagon for meditation, teaching, music and showing movies. The shape of this structure challenges the mind to think out of the square. ‘Outer space’ (90 sq mts) open sided (with drop screens) for all arts media. 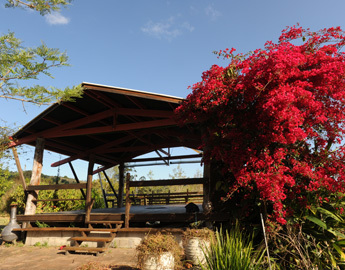 Equipped with cob pizza oven and large table, a great place to make and eat pizza with lots of people. ‘Heaven’ (70 sq mts) an enormous open deck - 3/4 covered – with beautiful views suitable for yoga, dance, weddings, celebrations, or any gathering…. or just relaxing in a hammock with a book.